There is no single source of a good natural green dye that is colourfast and resists fading. One scholar argues that there are no natural green dyestuffs that can produce a permanent green colour because all chlorophyll-based dyes eventually fade (Böhmer 2002, 103). This may explain why green was only rarely used across Southeast Asia before the availability of synthetic dyes. 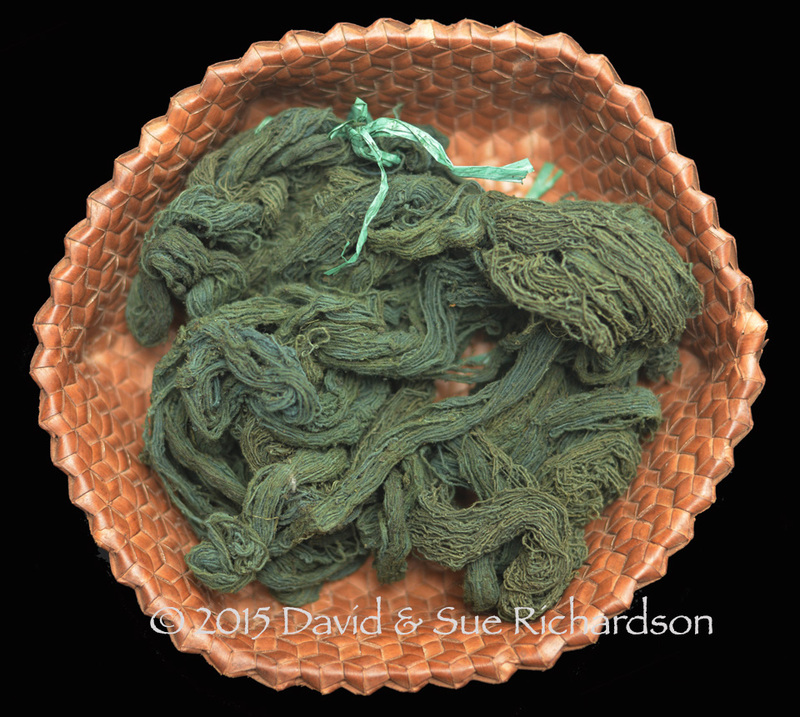 Natural green dyes are also quite rare. 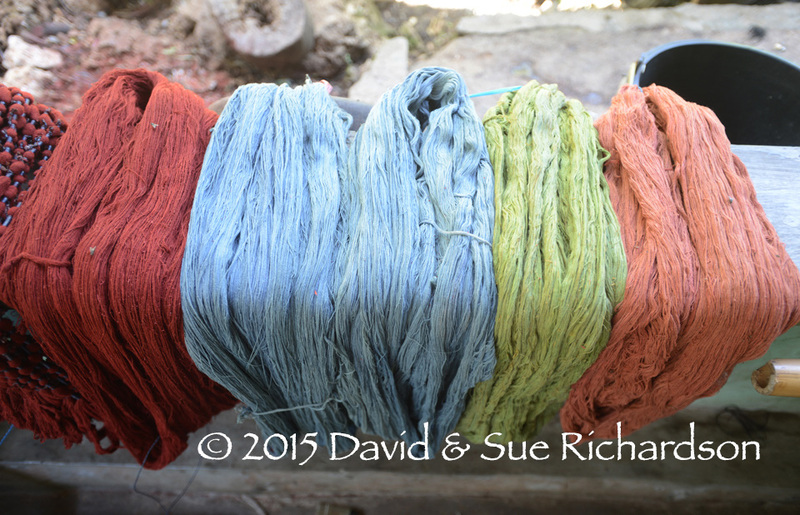 In a survey of 93 natural dyes, only 5 were green (Chakraborty and Chakraborty 2014, 235). A green dye must have two absorption bands, one in the red region and one in the blue. This is difficult to achieve (Roberts 2012, 133; Choudhury 2014, 86). The relative absence of green in the Islamic regions of Southeast Asia is perhaps surprising when one considers its association with the Moslem faith - green was supposedly the favourite colour of the Prophet. On Sumatra in the seventeenth century European traders noted that few Muslims were entitled to wear green. In Palembang the colour green was reserved for ‘the highest in the land’ (Watson Andaya 1989, 35). More recently silk selendangs of songket limar, songket lepus or lawon with a plain green centre were worn by widows who wished to remarry. 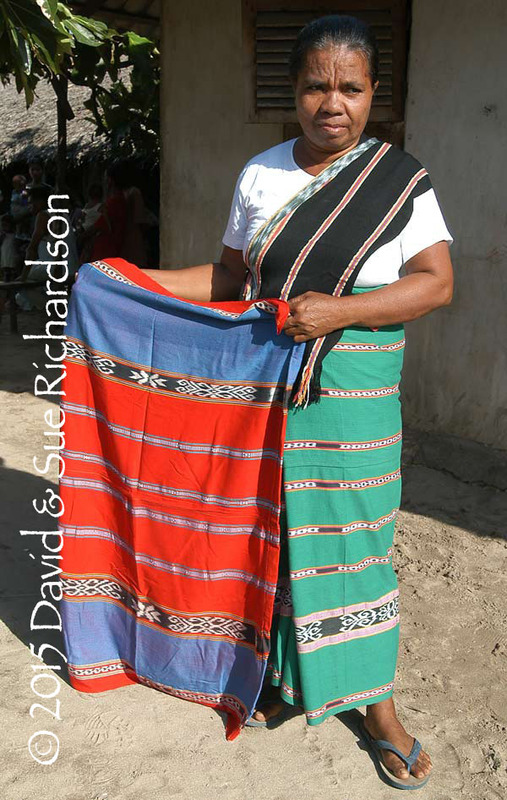 They were called jando beraes, meaning 'widow dressing up' (Jay 2014). 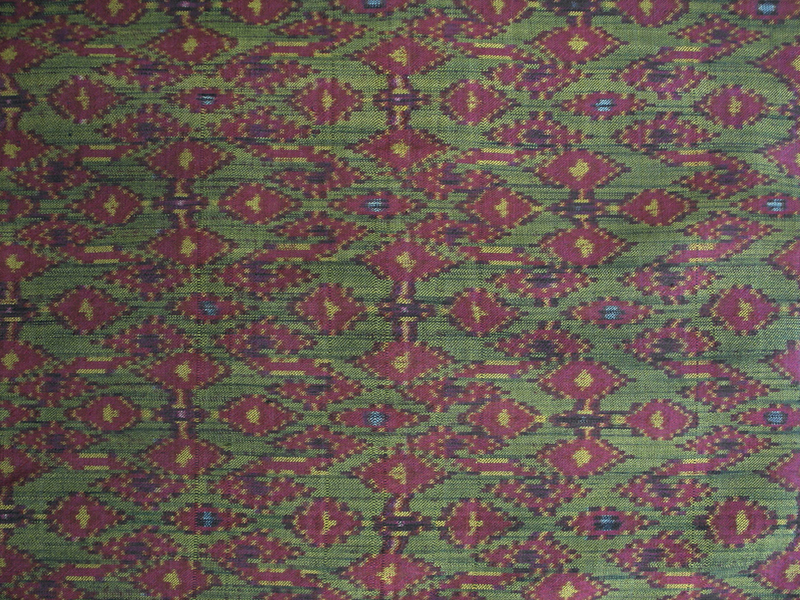 Silk kain songket lepus with a synthetic plain green centre from Palembang. Another factor might be that among some Indonesians, especially on Java, the colour green is associated with old age (Heringa 1989, 109). The most common method of producing green is by combining blue - almost universally indigo - and a natural yellow such as turmeric or jackfruit (Fraser-Lu 1988, 31). One option is to first treat the cotton with the yellow dye and then overdye with indigo. The other is to dye with indigo first and then overdye with yellow. The DOBAG project in Turkey has found that the latter option is easier to control and regulate (Böhmer 2002, 103). 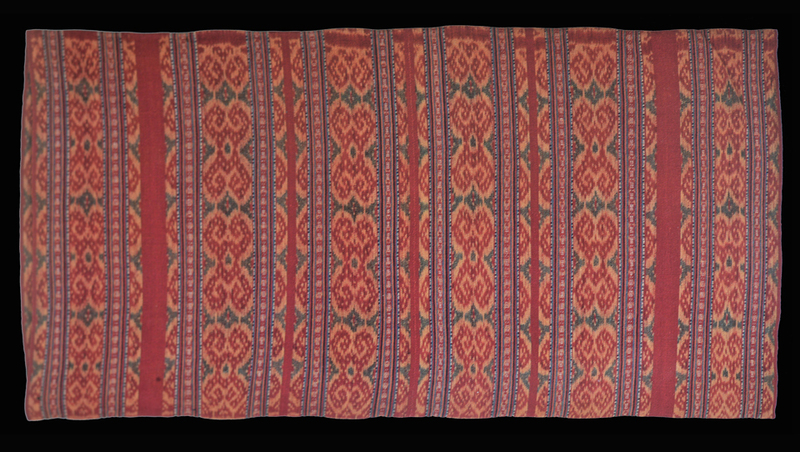 Many Sikka textiles contain stripes of bright yellow-green produced in this way by overdyeing indigo with yellow (Hamilton 1994, 67). Interestingly a study of Western historical textiles found that greens were always obtained by over-dyeing a blue with a yellow dye (Ferreira et al 2004). 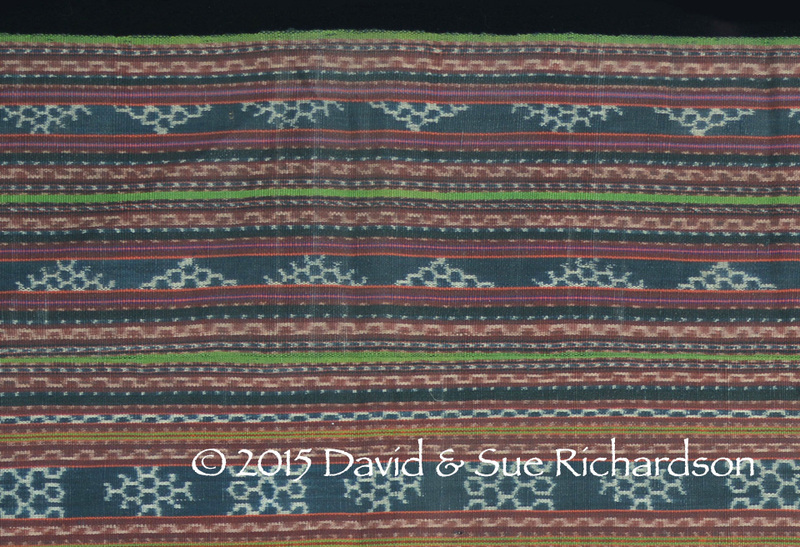 It is rare to find a naturally dyed Indonesian textile that is predominantly green. For those Indonesian textiles that contain a significant element of green, the green is almost universally synthetically dyed, whether produced locally or overseas. 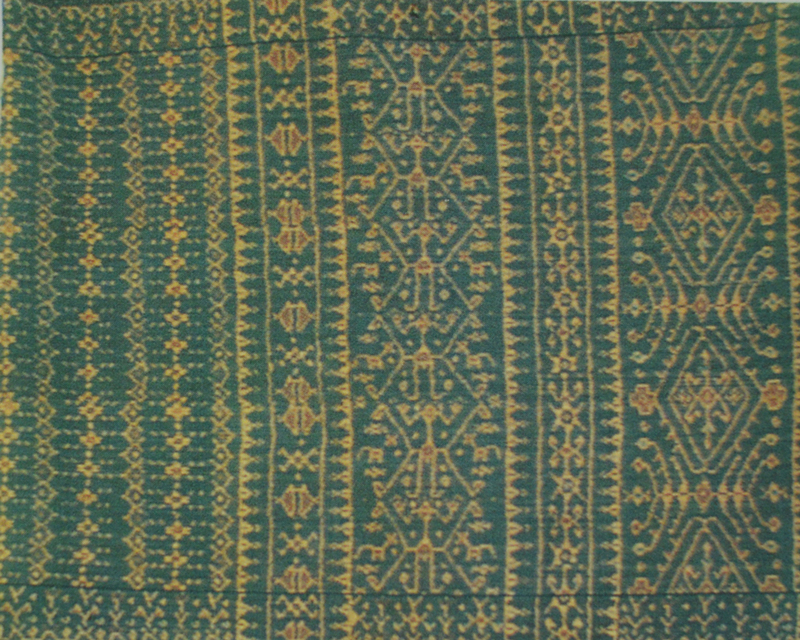 In the Lesser Sunda Islands natural green does not often appear in textiles, but when it does it is mainly in the form of narrow plain warp stripes. 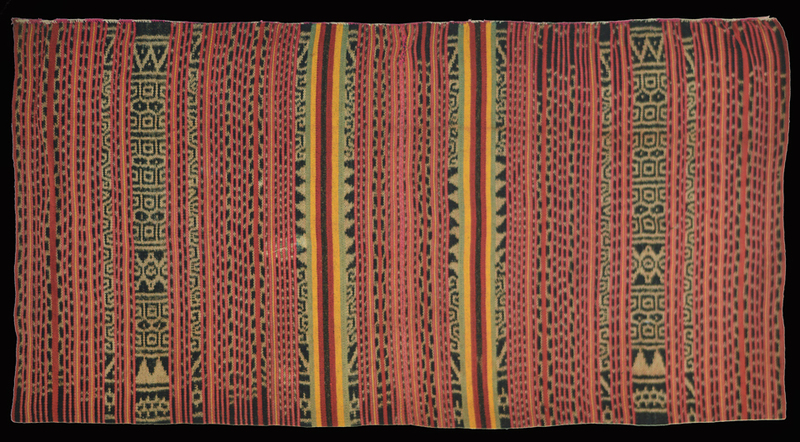 Green warp stripes are most likely to be found in textiles produced by the Ata Sikka in the district of Sikka Natar on Flores Island, and from Lamalera on Lembata Island. However in Sikka it seems that chemical green has also been frequently used for at least the past 50 years, and probably for longer. Today the widespread availability at local markets of synthetically pre-dyed commercial yarns, known in Indonesia as benang sutra, means that many modern sarongs are woven with bright emerald green or lime green warp stripes. The whole subject of natural green dyes has never been properly researched, so the amount of published material available is severely limited. One of the easiest ways of making green is to combine indigo and turmeric, known locally as kunyit. Turmeric needs no mordant and is the brightest of the naturally occurring yellow dyes. It is golden yellow and when overdyed with indigo produces a lovely green. At Sikka Natar the colour green, called da’ang tang, was produced from indigo overdyed with turmeric (Lewis 1994, 162). This method was also used for centuries by calico dyers on the Coromandel coast of India, who steeped the indigo-coloured yarn in turmeric for 48 hours before washing it in water acidified with lime juice (Swarnalatha 2005, 66). However turmeric is fugitive to visible and near-UV light, so fades quickly. It also has poor wash fastness. Consequently in many older Indian chintzes the green details such as leaves have faded to blue (Gittinger 2008, 22). A more stable, colourfast green can be obtained by overdyeing indigo with one of the more durable natural yellow dyes. The two main yellows preferred are from the heart or sapwood of jackfruit (Artocarpus heterophyllus) and from the bark of mango (Mangifera indica). The sapwood of jackfruit contains morin, a yellow flavonol, which is extracted by boiling woodchips in water. Some sources do not mention the use of a mordant while others include the addition of a source of aluminium. Morin readily forms complexes with metal ions such as aluminium. These complexes are more reactive than morin alone and therefore make stronger dyes. Indeed dyers find that the addition of a mordant produces a brighter yellow. Mango bark contains a cocktail of glycosides, tannins, flavonoids and phenolic compounds (Mmar Win and Moe Swe 2008). It is also slightly acidic (Chochai and Chochai). It produces a reddish or greenish dirty yellow when dyed on animal fibres, which appears to have good light and wash fastness. 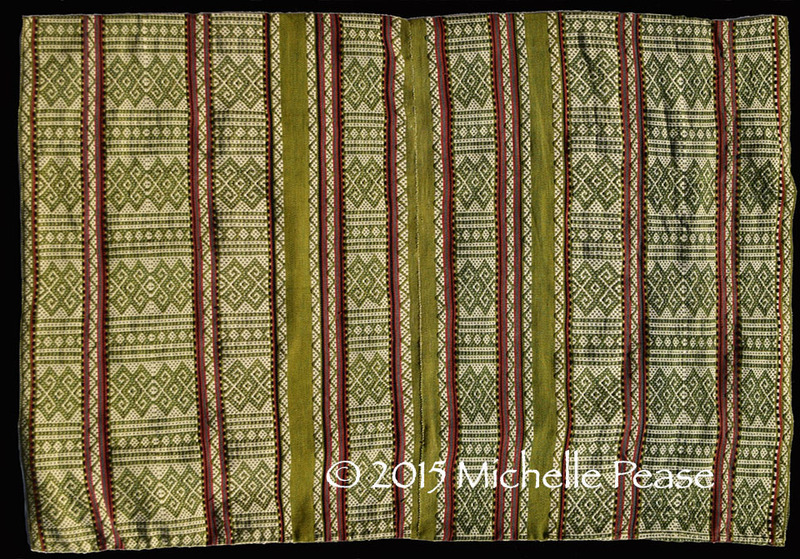 The Lio of Ende Regency do not use green stripes in their lawo sarongs. 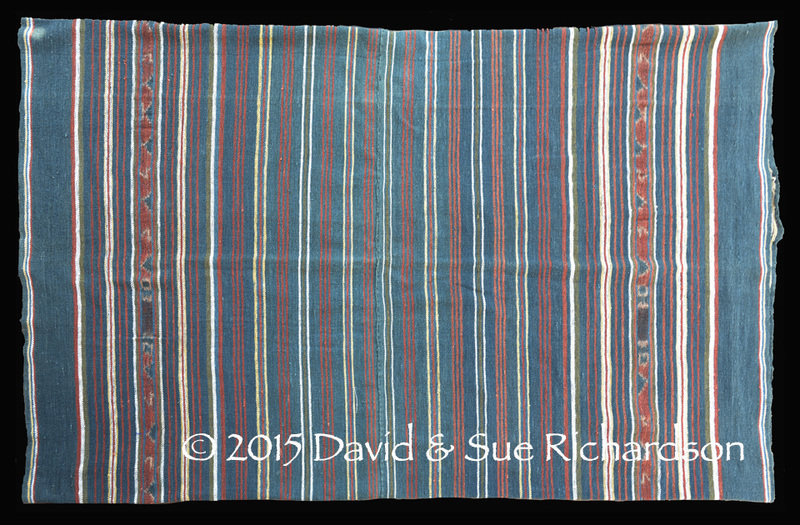 However they do make a man’s headcloth, which is red with yellow checks and has a double blue-green border. The latter is made from yarn that has been lightly dyed with indigo and then overdyed with a green dye produced from mango leaves, mango bark and turmeric. The resulting colour is called mbopo (Hamilton 1994, 142). Today most Lio men wear a square of batik instead. On the island of Lembata the green for narrow warp stripes was almost exclusively produced by successive dyeing with yellow and blue - with the exception of Lamalera (Ruth Barnes 1989, 15). 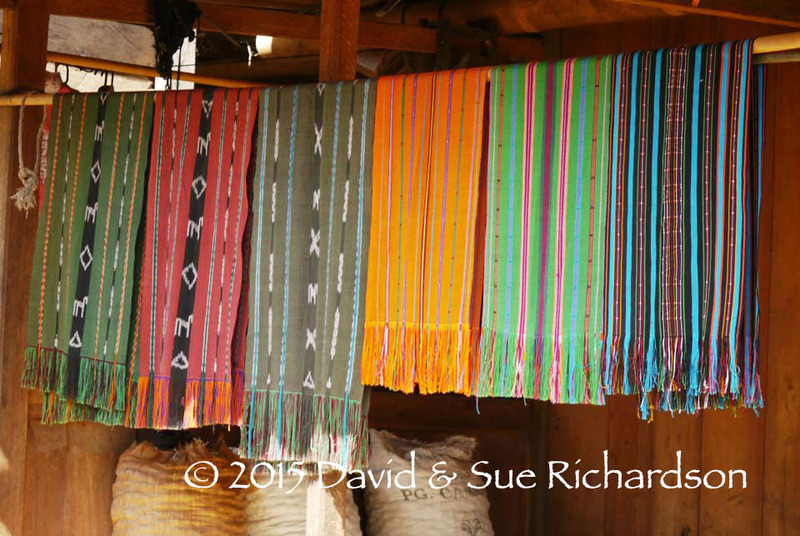 However weavers at Lamalera did produce a very bright green for everyday sarongs from a combination of turmeric and the leaves of uté keda or padé lolo beans. Unfortunately it faded within a year and was therefore unacceptable for adat cloths. The chief of the Amarasi, Usif Robert Koroh, told us that in the past green was obtained by overdyeing indigo with kayu kuning. 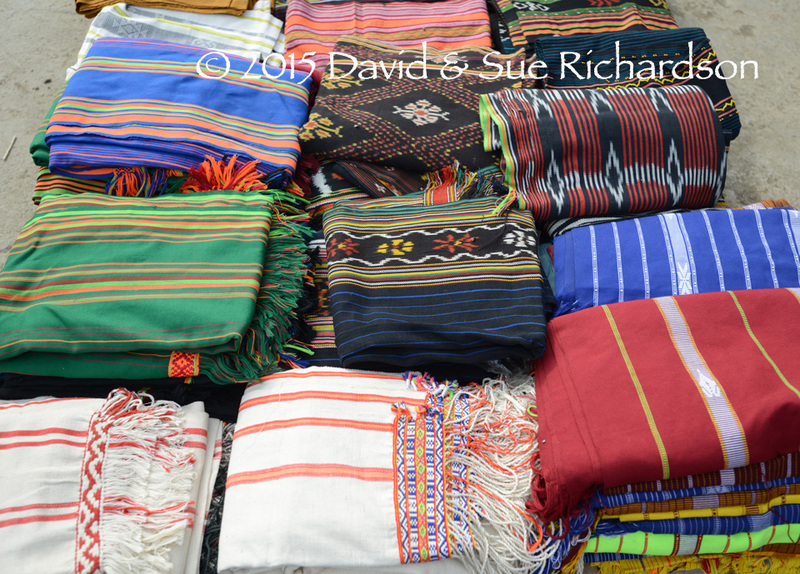 Today weavers from the same region incorporate narrow yellow and pale green warp stripes in their sarongs. Recently adventurous dyers in Baun have even produced a contemporary green version of their traditional morinda-dyed tais runat using indigo overdyed with a mixture of jackfruit and mango bark. However in this case the decorative bands of warp ikat have been replaced with bands of sotis or ‘warp-faced’ alternating float weave, using two warp sets, one white and one green. Chlorophyll is the most widely available pigment in the natural world, being present in all green plants. Chlorophyll is the key to the process of photosynthesis, absorbing light and releasing electrons that dissociate water and carbon dioxide to produce oxygen and carbohydrate. The green colour of chlorophyll is determined by its chemical structure, especially the magnesium ion at the heart of its porphyrin ring. If this is removed, the remaining ring structure becomes purple. The molecule occurs in various closely related forms, depending on the nature of its long unsaturated phytol side chain. 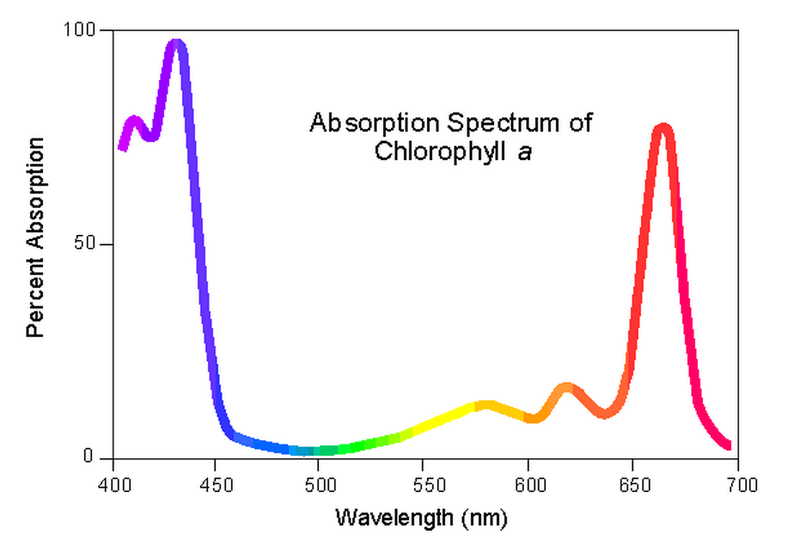 In higher plants it occurs as just chlorophyll a and chlorophyll b in a ratio of about 3:1 (Lee and Schwartz 2011, 242). Both contain a central highly conjugated aromatic porphyrin ring that absorbs light mainly in the blue and red parts of the spectrum, but not in the green or yellow. The chlorophylls are extremely sensitive to acids, alkalis, oxygen, heat and light. In the laboratory they must be preserved by storage in the dark at reduced temperature, even freezing. Within a plant they are protected from light irradiation by surrounding carotenoids and other lipids and are also constantly replaced, at least until the onset of autumn. Once the chlorophyll is isolated, the presence of oxygen and light accelerates its photodegradation into colourless products including methyl ethyl maleimide, glycerol and organic acids (Lee and Schwartz 2011, 242). Chlorophyll therefore makes an unsuitable dye for textile fibres, despite its ideal colour and universal availability. An additional problem is that chlorophyll is readily dissolved in organic solvents and has poor wash fastness (Zvezdina et al 2010). Although it gains a high affinity for polymer fibres such as cotton and acetate when it is ionised in weakly acidic solutions, this change is immediately reversed when the fibres are reimmersed in plain water. It seems that the leaves of a wide variety of plants can be used to produce green dyes, although many do not appear to be particularly stable. Thus the pounded leaves of jackfruit (Artocarpus integra) makes a beautiful chlorophyll green that degrades quickly. However there do seem to be exceptions. 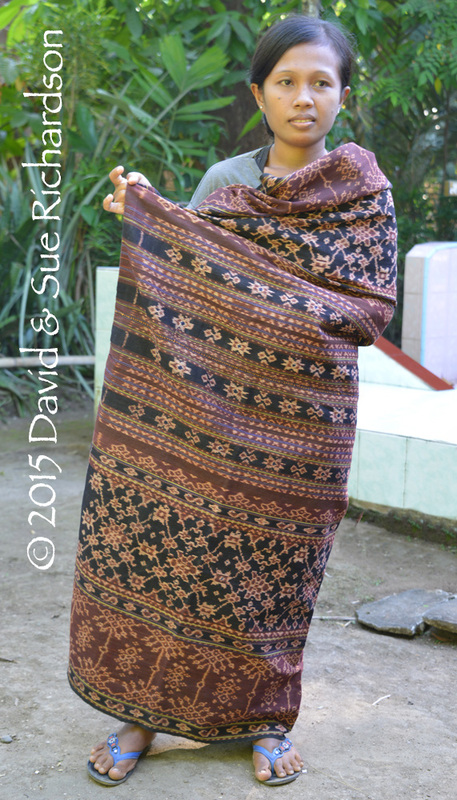 The weavers of Sembiran in north Bali remember using leaves from an unknown bush, locally called daun sugih (Nabholz-Kartaschoff 2008, 77). Green can apparently also be made from the leaves of the cotton plant (Widiawati 2009, 120). There is one report that they have used cotton leaves in Sikka (Fraser-Lu 1988, 31). In Sikka Regency on Flores Island, the women of Nita Kloang in the region of Krowé make a green dye from the edible leaves of the dadap or Indian Coral tree (Erythrina species such as E. subumbrans, E. variegata, E. indica and E. fuspa). Dadap is a deciduous, medium sized tree, armed with stout thorns (Jansen, Westphal and Wulijarni-Soetjipto 1997, 128). It is found throughout Southeast Asia and Indonesia, where it is used as a shade plant for cocoa and coffee plants. To make the dye the leaves are crushed with turmeric root and powdered lime. At neighbouring Nita Tabuk they use the leaves of the cassava or tapioca plant (Manihot esculenta) instead. Cassava was originally imported into the East Indies from Brazil by the Portuguese. 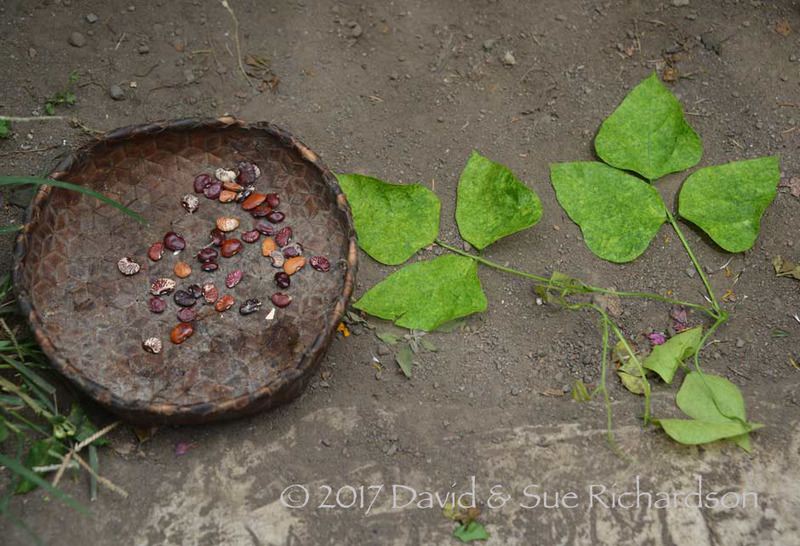 In the villge of Doka in the ‘Iwang Geté highlands of Sikka Regency they make a green dye from the leaves of the betel nut tree and the bihar or biharow plant mixed with kapur lime produced from burnt coral. Bihar is a local bush that produces edible nuts. At neighbouring Watublapi the dyers are very innovative and have developed a green dye from the leaves of the mango tree. Because these leaves are very strong and difficult to crush, this colour is the most difficult to produce. Green dyes are also made from papaya and cassava leaves, and these are preferred to mango by some of the weavers (Reiss, Jakarta Post, 08.10.2006). On Sumba and Timor they use both papaya (Carica papaya) and morinda leaves, which are pounded and boiled together with the cotton threads before being dried in the sun (International Conference on the Diversity of Nusantara Ikat Weaving 2003). On Timor various other plants, such as the leaves of banana and betel vine, have been reported for producing green (Yeager and Jacobson 2002, 65). Another source is from the leaves of a climbing vine known as the forest bean (kot no’o or kotono hutan in Dawan, ahan in Tetun), which is boiled with tamarind leaves and lime juice (Yeager and Jacobson 2002, 65). In an alternative recipe the leaves are mixed with those from a local mistletoe, Decaisnina stenopetala, known as tatiu te’e in Dawan (Cunningham et al 2014, 102). Fraser-Lu mentions the use of bean pods (1988, 31). The Biboki use forest leaves mixed with lime paste and lemon juice (Barrkman 2006, 94). Leaves of Daturia fastuosa are also sometimes used to produce green, but apparently not those of Sesbania grandiflora – see below. 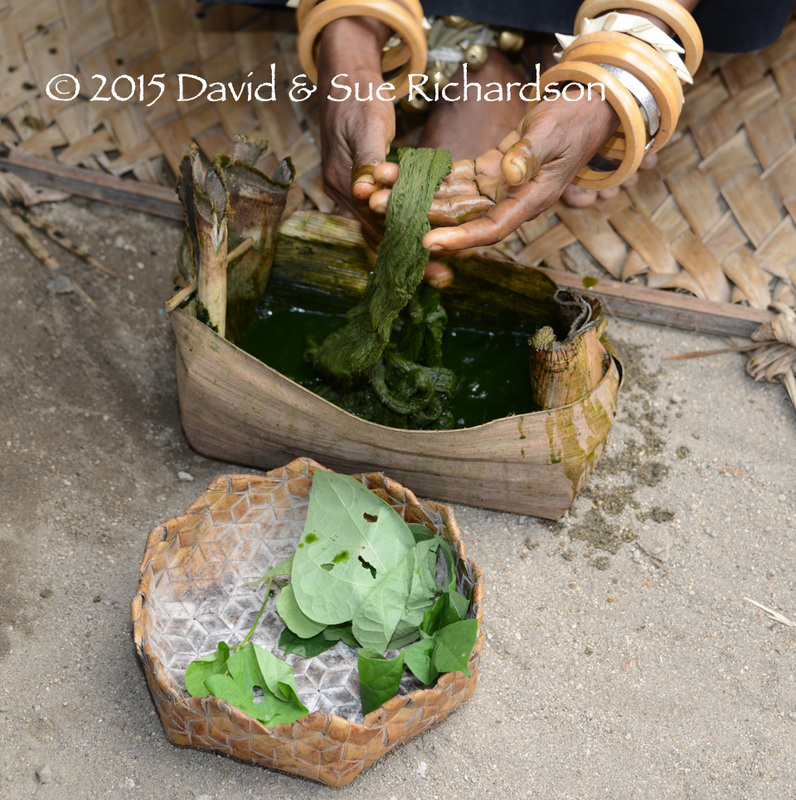 In Lampung, southern Sumatra, they prepare a moss green from the leaves of Pandanus (Totton 2009, 43). 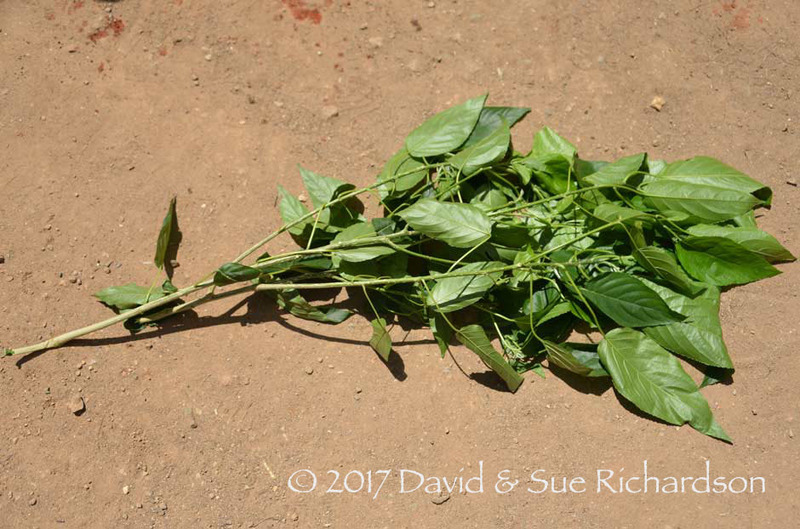 In Sabah on Borneo, the Bajao use the leaves of the red pepper to obtain a green colorant (Sylvia Fraser-Lu 31). Apparently the Burmese once extracted a green dye from the leaves of Asclepias tingens, a large twining, shrubby plant that was collected in Pegu in 1795 for the Botanic Gardens in Calcutta (Griffiths and Griffiths 1813, 400). Others have obtained a blue dye analogous to indigo from the same plant (Cooke 1861, 125). Another green dye has been claimed to have been obtained at Pegu from the leaves of Photinia serratifolia (Watt 1890, 452). In Thailand the German explorer Sir Robert Schomburgk discovered a mysterious and lustrous green dye that was obtained from a vegetable substance found in the deep forest. He thought that it deserved further investigation (Schomburgk 1861, 358). In the Philippines a light green dye is extracted from the leaves of Mimosa pudica known locally as makahiya (Ecosystems Research and Development Bureau 2012). In northeast India the leaves of the poisonous Jimson Weed, Datura stramonium, and Clerodendrum chinense have also been used to produce chlorophyll green dyes (Saikom et al 2013). They were both used for colouring small flags for religious offerings. In Bengal the leaves of both Hedyotis capitellata and the roadside weed Jatropha glandulifera were reported to produce a green dye (Watt 1890, 452). Another leaf dye from India has been extracted from the highly invasive Crofton weed, Eupatorium adenophorum. Depending on the mordant used on the cotton, different shades of green can be achieved such as greenish raw umber, light green raw umber, light umber sienna and olive green (Bansal and Sood 2001). Light umber sienna was the most colourfast. 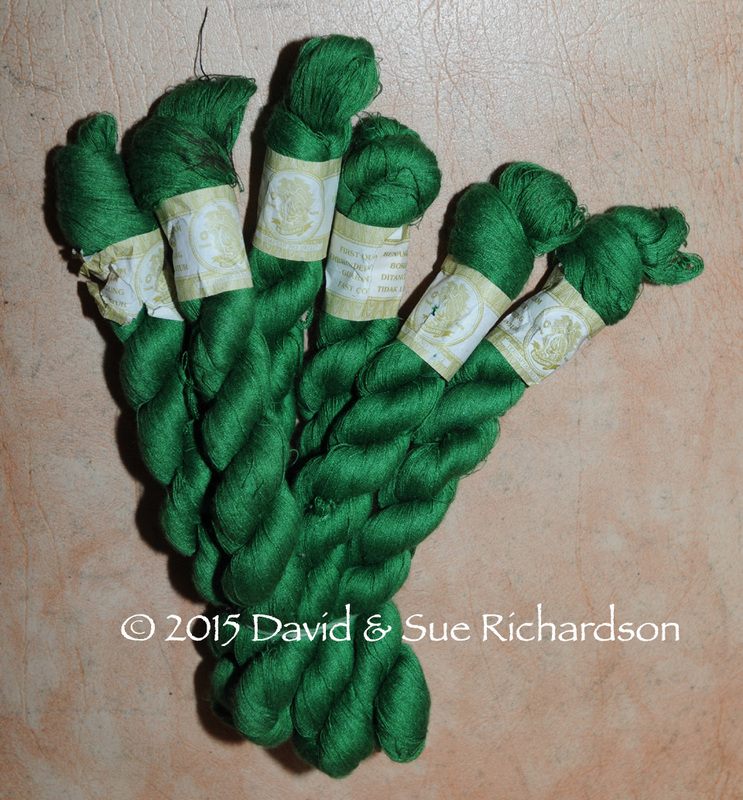 The same dye gives a very good green on silk and has excellent fastness properties (Sharma et al 2007). Ruth Barnes claimed that on Lembata Island only the weavers of Lamalera obtained their green dye by crushing the leaves of plants (1989, 15). Elsewhere on the island they used indigo and a yellow dye. This is not correct. On the Ata Déi peninsula, weavers use several types of green leaf to extract chlorophyll dyes. 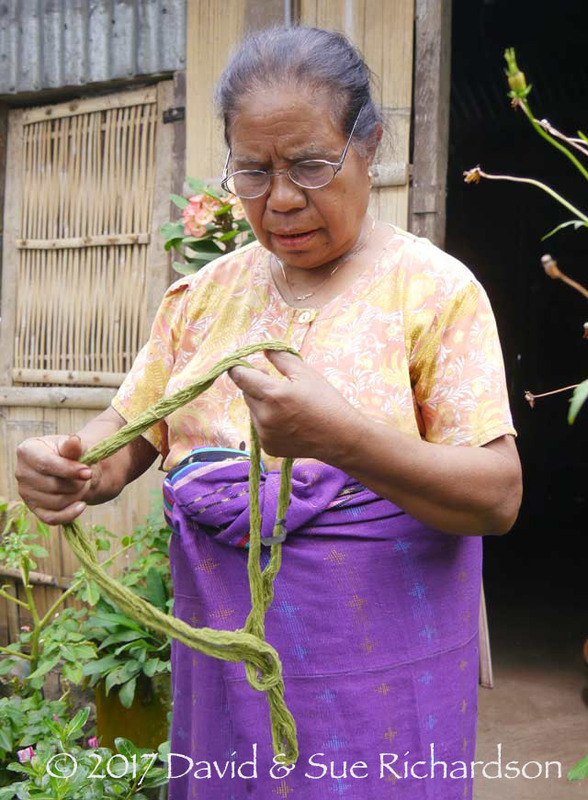 At Lerek they use the leaf of a climbing vine-like bean that grows in the forest, called utan herani. The raw bans are poisonous but can be eaten provided they are cooked seven times, after changing the water at every stage. To make a green dye, 30 to 50 leaves are pulped into a liquid and mixed with two glasses of hot water and a very small amount of kapur powdered lime. The dry cotton yarn is immersed in the dye mix and then dried inside the house, shielded from the light. The resulting green will fade quickly in sunlight. At Watuwater they produce a similar green dye using the leaves of a big tree, locally called kruhi. The pulped leaves are mixed with a little kapur. The addition of cold water produces a light green colour while the addition of hot water results in a stronger green. At Lamalera they produce a green dye from the leaf of a different local tree. The women that we meet every year describe the plant that they use as turi and note that it has fern-like leaves, although Ruth Barnes refered to it as dolima or teluma in Lamaholot and pohon ata in Indonesian (Barnes 1989, 31). It is not clear whether this is just another chlorophyll dye or whether it contains additional pigments. Analysis of the leaf extract has identified a mixture of chlorophyll, flavonoids and polyphenols (Swami et al TATM 2012). 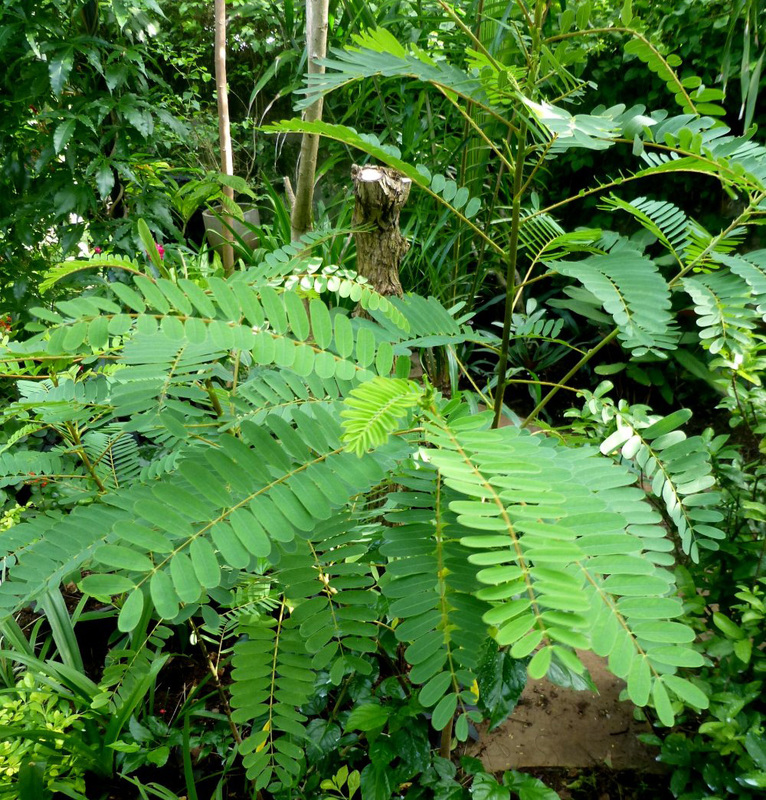 Turi or teluma (Sesbania grandiflora) is a small fast-growing and short-lived loosely branching tree that grows to about 5 to 12 metres in height. It re-sprouts vigorously following harvesting. It has compound leaves and clusters of red or white pea-shaped hanging flowers. The fruit pods look like long hanging beans (National Tropical Botanical Garden, Hawaii). Some fifty species of the Sesbania genus have been identified across the tropical and subtropical regions of the world (Char 1983). They belong to the pea or Leguminosae family. Sesbania grandiflora is native to tropical Asia with a natural range that extends from India to Australia. It is widespread in India, where it is known as agati or agathi, as well as Malaysia, Indonesia, and the Philippines. It is extensively grown for fuel and fodder. The tree grows in tropical dry and moist forest from sea level to an altitude of 800 metres. It is frost-sensitive and requires an annual precipitation between 4.8-22.5 dm and an annual temperatures of 24 to 27°C (National Tropical Botanical Garden, Hawaii). It is commonly found in disturbed and agricultural environments including along roadsides, on dikes between rice paddies, and in backyard vegetable gardens. Sesbania grandiflora can tolerate waterlogging, alkaline, and saline soils and is therefore ideally suited to environments that are seasonally waterlogged or flooded. It thrives in coastal environments and is also drought-tolerant. It has been introduced and has become established in cultivation in Southern Florida, Hawaii, Jamaica, Mauritius, Central America, and South America. At Lamalera the leaves are crushed and mixed with lime in water along with some turmeric root. 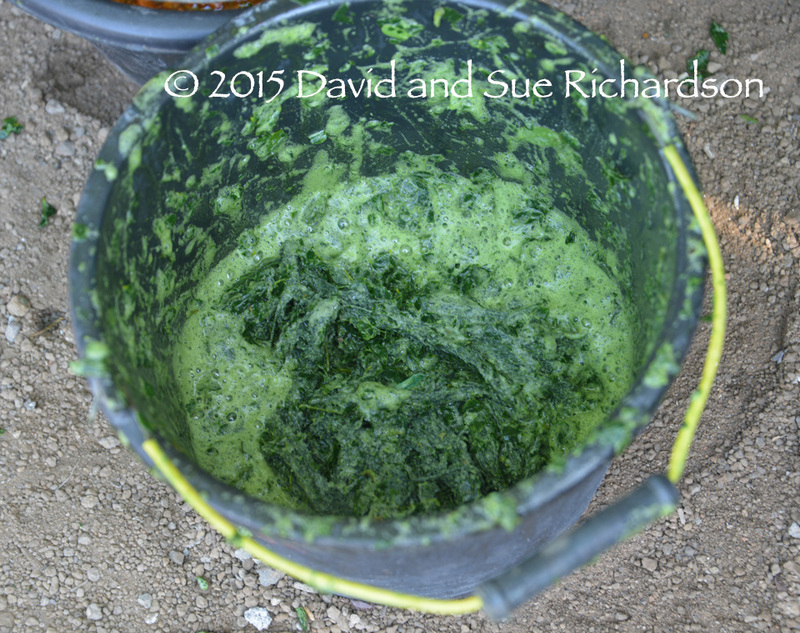 The resulting dye is a dull dark moss or military green and smells like new-mown hay. On cotton the colour is noticeably uneven but does seem to be quite colourfast. A skein of cotton dyed with turi, from Lamalera, Lembata Island. To obtain a blue-green the weavers first dye the cotton a light blue with two immersions in indigo before the final immersion in teluma (Barnes 1989, 31). The leaves of Sesbania grandifolia have also been used to produce green dyes in Thailand (Sylvia Fraser-Lu 31). 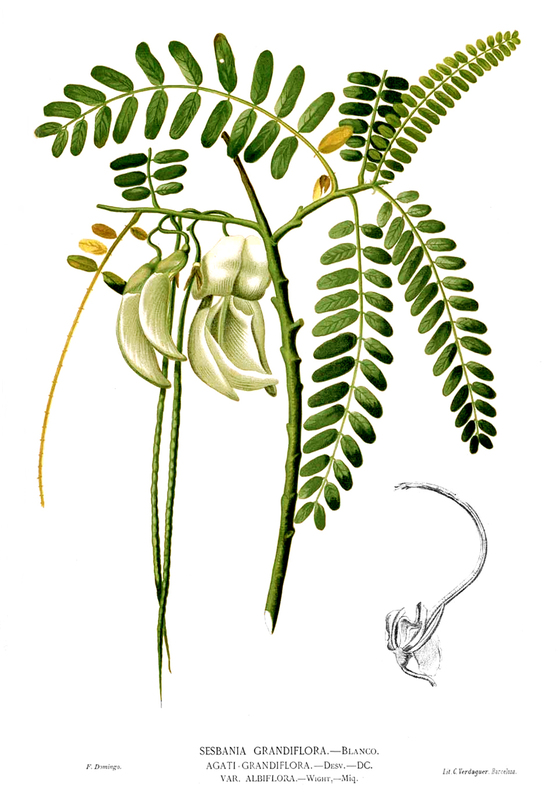 The most common species of Sesbania found in India is Sesbania aculeata, known as Dhaincha, Danchi or Dunchi. It is a relatively low, erect sub-shrub. On cotton it has been shown to produce a range of ‘camouflage’ greens (Swami et al 2012). Depending on the mordant used – aluminium, copper, iron, chrome or tin – these ranged from sap green, to khaki, yellow-green, leaf green, army green and bottle green. Copper sulphate, ferrous sulphate and chrome gave the darkest shades, while the lighter tints were achieved with alum and stannous chloride. Alum produced the best wash and light fastness. The genus Garcinia encompasses over 200 species of large evergreen trees and shrubs, including the mangosteen, Garcinia mangostana (Osman and Milan 2006, 1). They are characterised by a straight trunk and a conical canopy. The Garcinia species are all pantropical with a range extending from India and Sri Lanka into south China, Southeast Asia (Burma, South Vietnam, Thailand, Cambodia and Malaysia), the Philippines and Indonesia (Osman and Milan 2006, 15-16). There are over 25 species from the Indian subcontinent, 23 species in Thailand and 20 in Indonesia. Garcinia really thrives on Borneo. Certain species of Garcinia are the source of gamboge, a bright golden yellow pigment obtained by grinding down the hard brownish-red resin that is extracted from the bole of the tree in the form of a milky, light yellow latex. The resin is tapped from cuts spiralling down the trunk and is collected in bamboo canes. The resulting tubes of solidified pigment were called pipe gamboge. The resin was also shipped in the form of cake or lump gamboge and coarse gamboge (Christison 1836, 233-2). The name gamboge is derived from Kamboja, an early name for Cambodia. The main varieties harvested are Garcinia hanburyi, which grows in Cambodia and Thailand and produces Siam gamboge; G. morella and G. cambogia, which grow in India and Sri Lanka and produce Ceylon gamboge; and G. elliptica and G. heterandra, which are found in Burma (Eastaugh, Walsh, Chaplin and Sidall 2008, 170-171; Yaacob and Tindall 1995, 15). In southern India and Sri Lanka, Garcinia cambogia is known as the gamboge tree and is the source of an acidic fruit used as a substitute for tamarind and lime. The French refer to it as guttier. The gamboge tree is known as rung in Cambodia, rong in Thailand and vang nghè or dang hoàng in Vietnam (Lemmens and Soetjipto 1991, 75). Gamboge resin is composed of 70-80% resin and 15-25% water-soluble gum. Chemically it is mainly composed of gambogic acid, but it also contains a wide range of xanthones, including gambogin (Asano et al 1995). It is soluble in water, alcohol and ether, forming an intense yellow solution that turns to red following the addition of a small quantity of alkali. It is primarily used as a pigment in the paint and lacquer industries. It is possible that there are other natural sources of green. 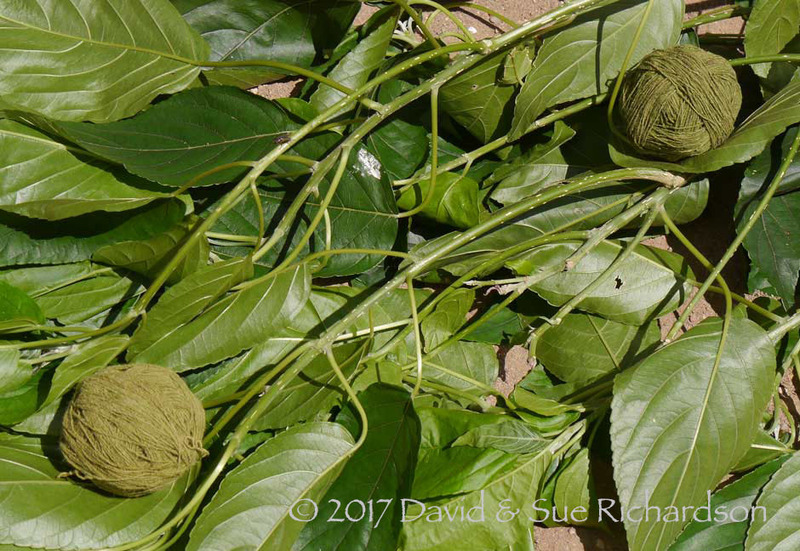 In Thailand it has been reported that a green dye is obtained by boiling the roots of a climbing plant called talaeng (Manilerd 1987, 31). 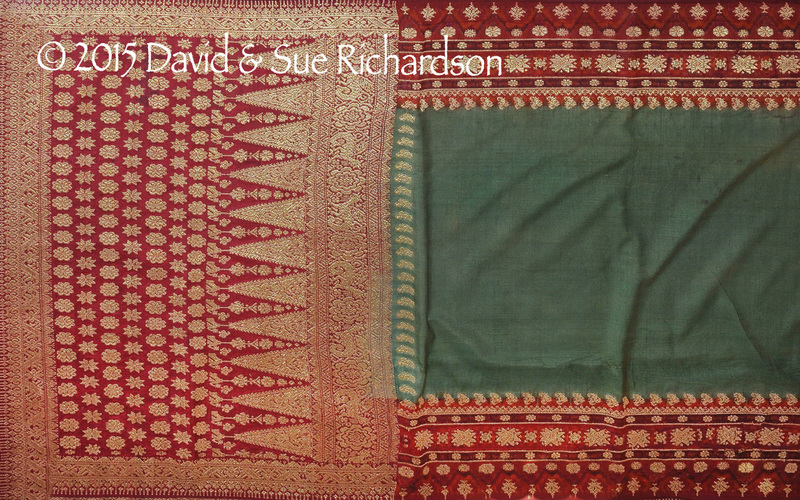 Unlike other parts of Southeast Asia, the colour green seems to have been traditionally used in many Cambodian textiles, albeit dyed on silk rather than cotton. Silk samphot hols usually contain the colour green in the form of pairs of narrow alternating green and yellow warp stripes delineating the geometric side bands that border each side of the cloth. However some also contain green within the central field. Sampots with a predominantly green centre field seem to have had a certain prominence, being associated by Khmers with Wednesday and the god Phut, and by Moslems with the Islamic faith (Green 2003, 56). Historical records are limited, so we should be cautious. Stoeckel implied that there was only one traditional source of green, which seems unlikely. This was from the leaves of the local doeum lovieng tree, the identity of which remains unclear (Stoeckel 1923; Groslier 1921/23, 398). 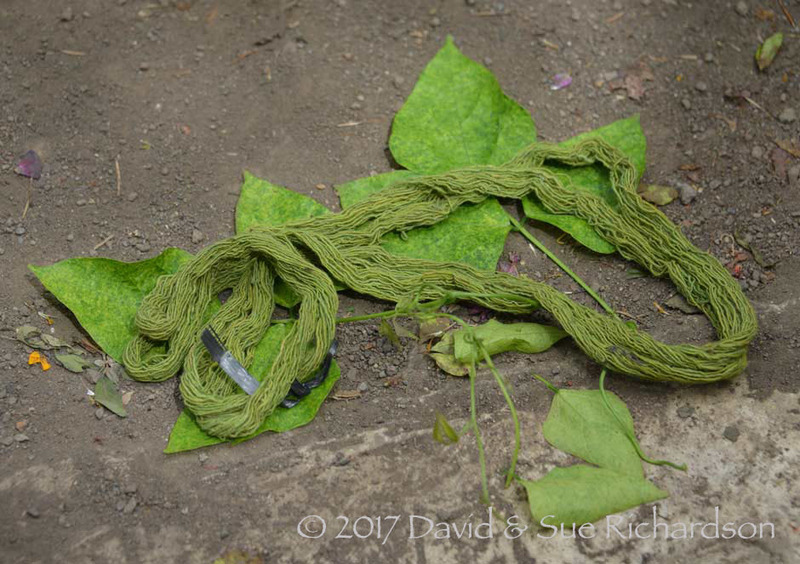 Gillian Green suggests that more recently green was obtained by overdyeing yellow-dyed yarns with indigo (Green 2003, 56). She adds that this colour was fugitive because, over time, the indigo faded to leave yellow – a strange comment because while indigo can be removed by abrasion it does not easily fade. It is more likely that the yellow, not the indigo will fade. 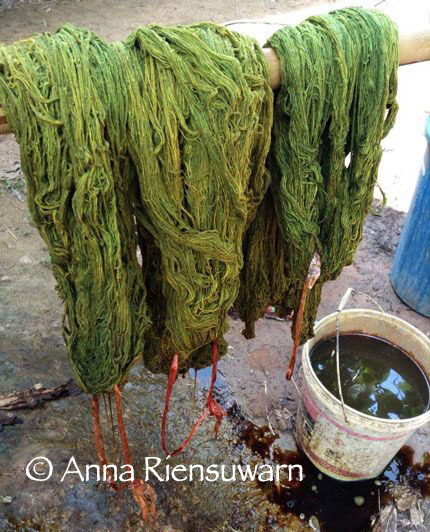 The colour green was also achieved by overdyeing indigo with yellow extracted from mango bark (Dy Phon 2000, 427). One of the earliest chemical dyes - launched in 1814 - was Schweinfurt or Paris green, a deadly poisonous concoction based on copper arsenite. The earliest aniline greens developed in the 1860s had good colours but were not lightfast. Aldehyde Green was synthesised in France from rosaniline in 1861 and was used to dye silk (Watts 1872, 162). It had a brilliant hue in daylight and did not look blue in gaslight, a valuable benefit for that era. Iodine Green was also obtained from rosaniline at about the same time. It was bluer than Aldehyde Green and was also used on silk. Other aniline blue-greens included Perkins Green, Methyl Green and Hofmann’s Green (Ohio State Pharmaceutical Association 1985). They all required a mordant. A flood of more colourfast dyes were discovered in the last quarter of the nineteenth century, many developed in the laboratories of the rapidly growing German chemical industry. In 1877/1878 two German chemists, Fischer and Döbner, independently synthesised Malachite Green, a triphenymethane dye that is still in use today. Acid Green was developed in the same year by sulphonating Malachite Green (Georgievics, Grandmougin and Mason 1920, 505). Both were blue-green and colourfast. Fischer also discovered the thiazine dye Methylene Green in 1878 (Derry and Williams 1960, 546). Alizarin Green was also developed in 1878 by Baeyer (Abelshauser et al 2003, 64). These were followed by the emerald green nitroso dye Naphthol Green in 1884, and by Diamine Green B in 1891 - the first green azo dye. Further greens were developed in the early twentieth century. In 1920 ICI developed the first green vat dye, the brilliant green and highly stable Caledon Jade Green, which has outstanding fastness. In 1932 CIBA introduced Chlorantine Fast Green, a novel synthetic dye that linked together a blue anthraquinone dye and a yellow azo dye so that the combined molecule has two chromophores, which together gave the appearance of green. 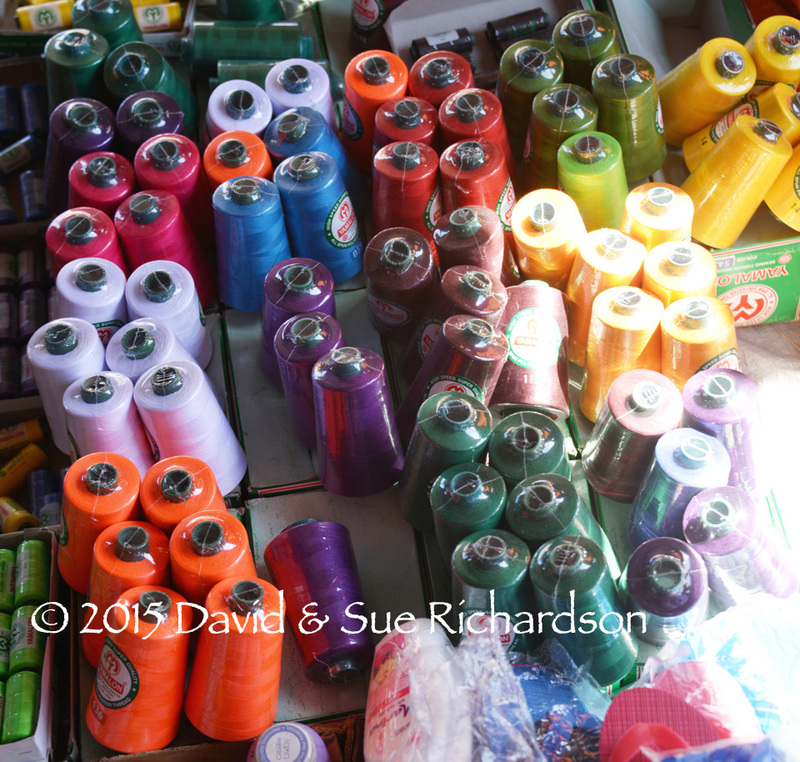 In the absence of chemical analysis it is hard to know the composition of the commercial dyes that are sold in markets across Southeast Asia today. In Indonesia various local brands are available, such as Kresno, Nilon, Wantex and Warna Textile, all offering a range of basic colours including green and, in the case of Kresno, light green. Wantex seems to have the widest range with 36 different colour shades. The dyes that these brands offer are unlikely to be as advanced as those available in the West and are probably of Chinese origin. Although China produces 33% of the world’s dyestuffs and contributes 35% of world dyestuff exports, its technology significantly lags that of Europe (Japan Chemical Week Nov 2000). 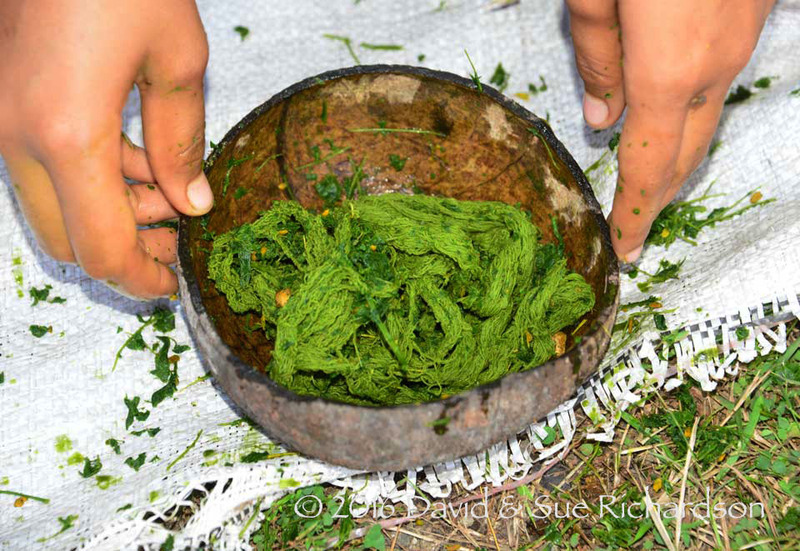 Emerald green synthetic embroidery yarn being used by a weaver on Ternate Island, Maluku, in 2012. The earliest aniline dyes seem to have arrived in Indonesia in the 1880s (Rodgers, Summerfield and Summerfield 2007, 31). They probably reached parts of the Lesser Sunda Islands not long after, especially those ports that were serviced by Dutch steamers – Pabean on Bali, Apenan and Labuan Haji on Lombok, Ende and Larantuka on Flores, Waingapu on Sumba, and Kupang and Atapupu on Timor, as well as Roti and Savu (A Manual of Netherlands India 1920, 80, 382, 387). However it is likely that most of the dyes imported up to the 1920s were blue, red and magenta rather than green. For a start almost two-thirds of the 672 tons of aniline dyes imported into the Netherlands East Indies in 1923 consisted of synthetic indigo (Report on Economic and Commercial Conditions in the Netherlands East Indies 1922, 45). Most remaining synthetic dyes would have been purple, red, orange and yellow. Even today the number of homogeneous green dyes and pigments remains significantly less than that of any other major colour (McLaren 1986, 26; Lenoir 2012, 341-458; Derrett-Smith and Gray 2013, 49). 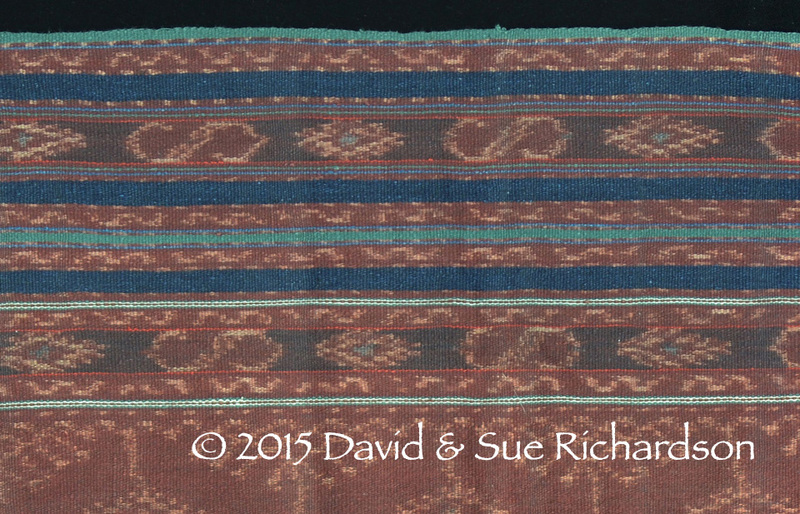 It is impossible to say how quickly synthetic greens were incorporated into Lesser Sunda Island weavings. 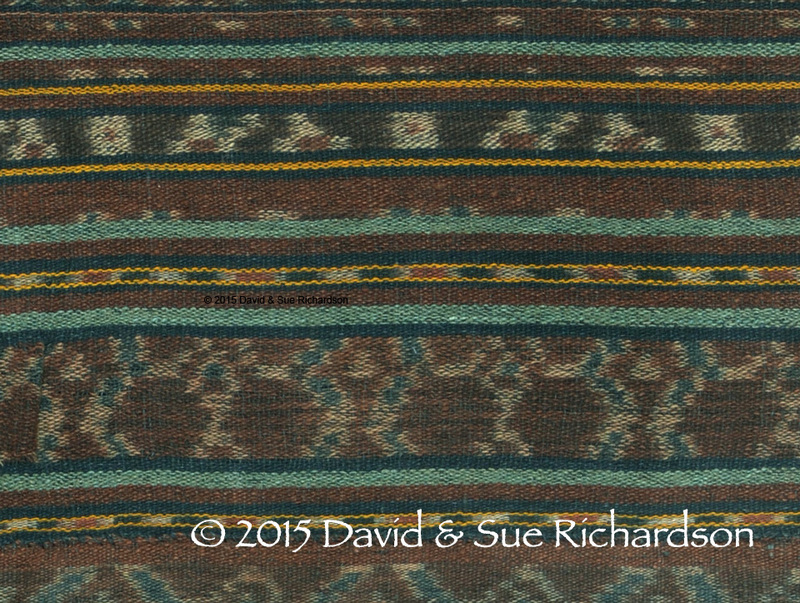 Any green that was included in early weavings from around the turn of the century is likely to have faded to blue or brown by now (Brackman 2009, 61). 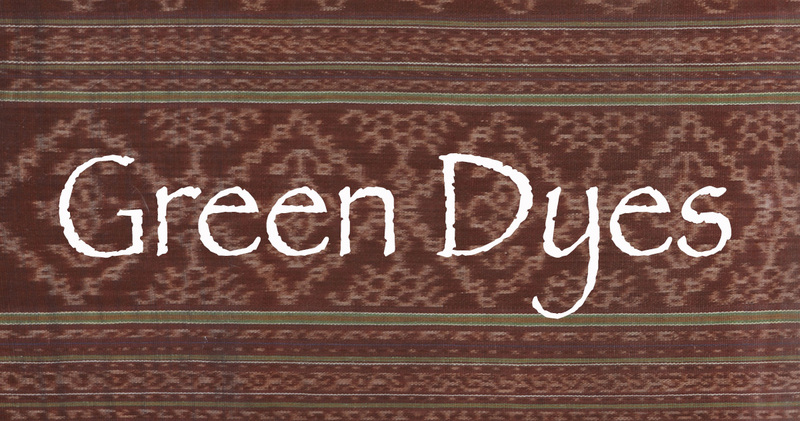 Certainly by the 1950s and 60s more modern lightfast synthetic greens were being used in the stripes in Sikkanese sarongs. They continue to be used in this way today without undermining the regions traditional textile culture. 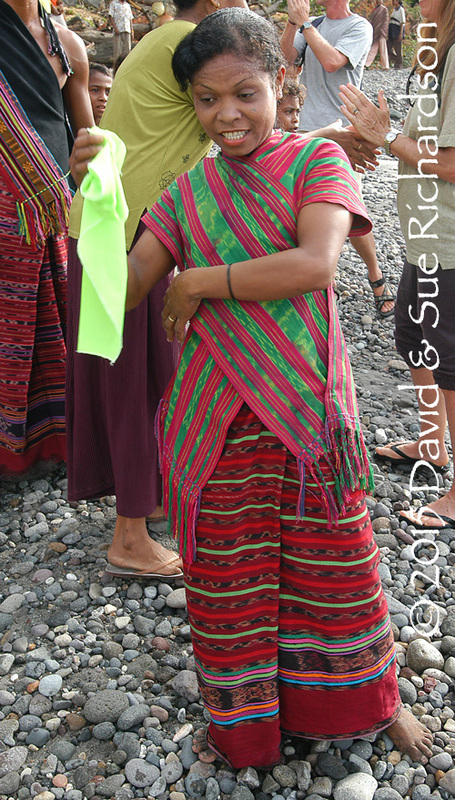 In some regions of Flores such as East Flores and Ende it is hard to find green in any textile. Yet there are always exceptions. De Jong photographed a lawo pundi with a blue-green background in Nggela the 1980s. However this seems to be an exception, as we have never seen an element of green within this village ourselves. Synthetic green still seems to be used sparingly in those regions that retain a degree of their former textile culture, such as most of Flores, Lembata, Savu and East Sumba. It is more extensively used in those regions that are in the process of losing or have already lost their textile culture, such as much of Bali, Sumbawa, Manggarai and Ngada in Flores, Solor, Adonara, Alor, Roti and West Sumba. Bansal, S., and Sood, A., 2001. Development of vegetable dye on cotton from Eupatorium Leaves, Textile Magazine, vol. 42, issue 8, pp. 81-84. Lee, Jae Hwan, and Schwartz, Steven J., 2011. Analysis of Carotenoids and Chlorophylls in Foods, in Methods of Analysis of Food Components and Additives, Ötles, Semih (ed. ), Boca Raton, pp. 231-252. Mar Win, Zin, and Moe Swe, Moe, 2008. Purification of the Natural Dyestuff Extracted from Mango Bark for the Application on Protein Fibres, World Academy of Science, Engineering and Technology, vol. 46, p. 536. Patra, S.K. ; Nanda, B.N. ; Nayak, A.; Das, N.B., 2000. Yellow dye from debarked jackfruit wood, Colourage, vol. 47, issue 8, p. 17. Rose, N. M.; Singh, S. S. J.; Khanna, S.; and Yadav, S., 2003. Natural green colour from ornamental mustard leaves, Asian Textile Journal, vol. 13, issue 9, pp. 73-76. Swami, Charu; Saini, Sangita; and Gupta, V. B., 2012. Extraction of a Natural Dye from Sesbania aculeate Plant, Journal of Textile and Apparel Technology and Management, vol. 7, issue 4, pp. 1-13. Swami, C.; Saini, S.; and Gupta, V. B., 2012. A Study of Green Dyeing of Cotton with Ethanolic Extract of Sesbania aculeate, Universal Journal of Environmental Research and Technology, vol. 2, issue 2, pp. 38-47. Zvezdina, S. V. M.; Berezin, B.; and Berezin, B. D., 2010. Natural dyes based on chlorophyll and protoporphyrin derivatives, Russian Journal of Coordination Chemistry, vol. 36, issue 9, pp. 711-714.